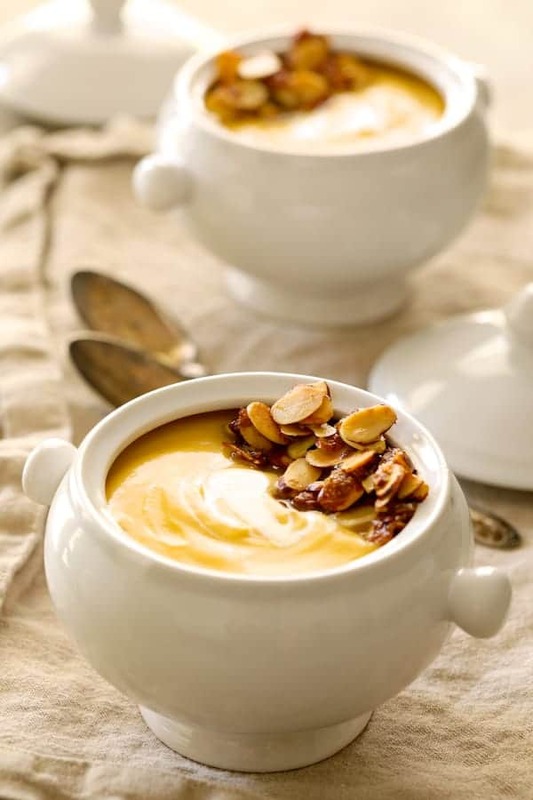 Pumpkin Soup with Marsala and Mascarpone with a lovely toasty, buttery almond topping is the perfect elegant starter to all your holiday meals! 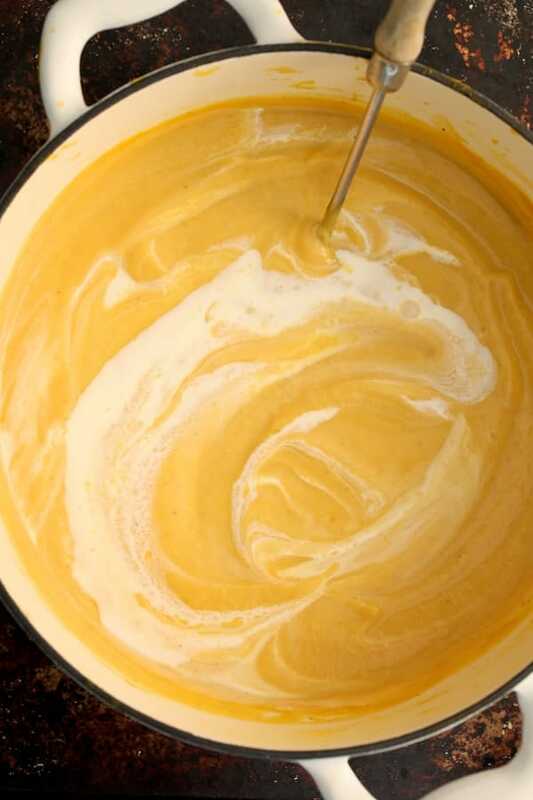 Does the world need another pumpkin soup recipe? 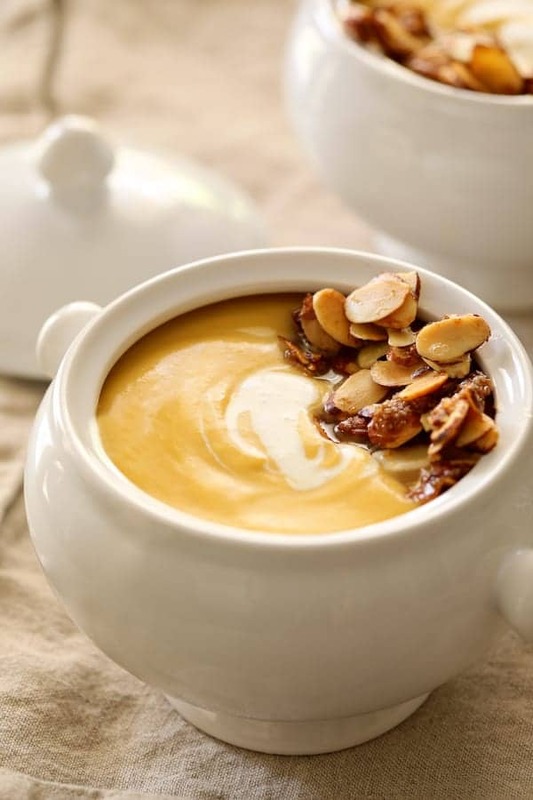 Thinking it needs this Pumpkin Soup with Marsala and Mascarpone! While traveling through Europe this past fall, I noticed that pumpkin soup is big in Switzerland, Austria and Germany. However, not so much in Italy and France. Perhaps they haven’t had a good Italian-inspired version of pumpkin soup to brag about and to showcase? Time to change that! 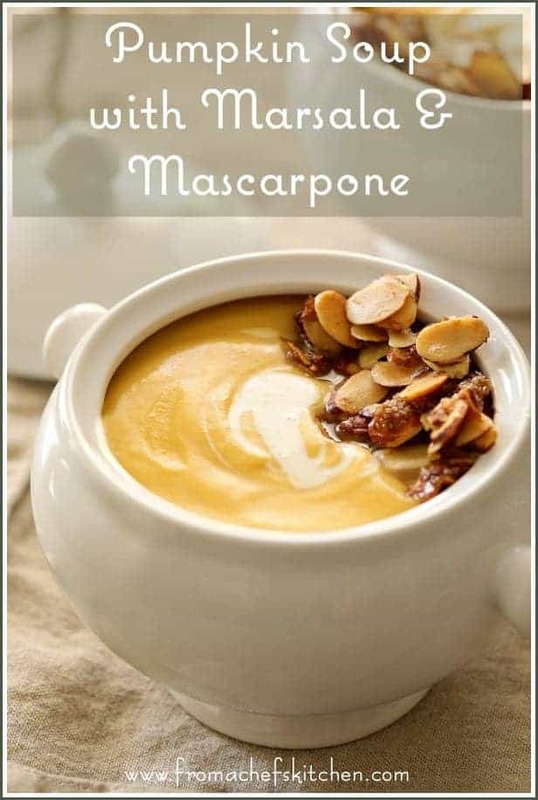 The lovely sweetness of pumpkin pairs perfectly with the light, sweet winey taste of Marsala in addition to the mildly tangy flavor of mascarpone cheese. Marsala is a fortified wine from Sicilty. Fortified means that a distilled spirit such as brandy has been added. Because of that, Marsala will keep when opened for a much longer time than regular wine. Mascarpone is an Italian cream cheese that has only a few ingredients but has the consistency of butter. Wait. Pumpkin? Marsala? Cream cheese with the consistency of butter? I’m in! Start by cooking onions and garlic in some olive oil and butter. Add the Marsala wine so that it cooks a little bit and reduces down. And you end up with one super-elegant, creamy delicious soup! And you’re wondering…. the almonds? I had the worst time garnishing and figuring out a topping for this Pumpkin Soup with Marsala and Mascarpone! I tried fried sage leaves, pumpkin seeds and I tried nothing but a swirl of cream. So, I dug back into my garnishing playbook and decided on these Butter and Turbinado Toasted Almonds. Toasty, buttery and only slightly sweet. Perfect! Simply beautiful and perfect for your next dinner party! 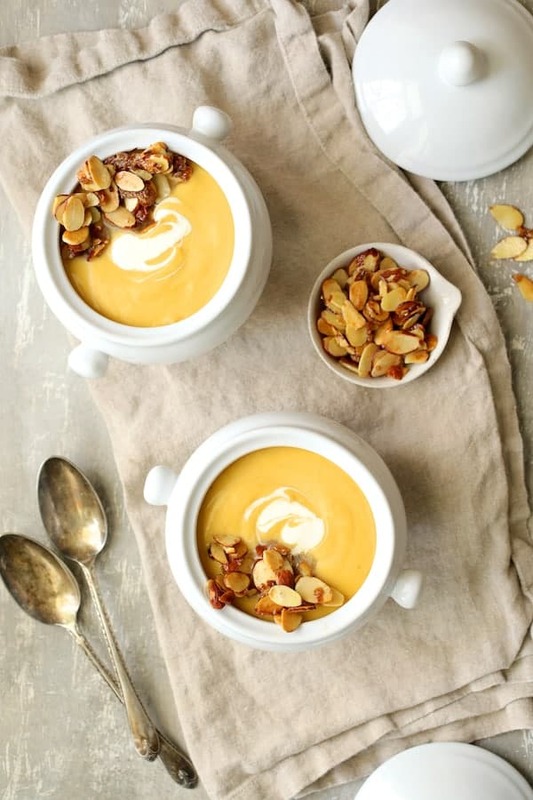 Be sure to check out these other beautiful soups perfect for fall and winter entertaining! Heat butter and olive oil in a large soup pot or Dutch oven over medium-high heat. Add the onion and cook 6-8 minutes or until softening. Add the flour and cook 1-2 minutes. Slowly stir in the Marsala wine. Bring to a boil. Reduced heat and cook 1-2 minutes or until a thick paste forms. Add the chicken broth and pumpkin puree. Reduce heat and simmer 20-25 minutes or until onion is very tender. Remove from heat. Stir in mascarpone and heavy cream. Puree with an immersion blender until very smooth. Everything about this recipe has my soul screaming “YAAAASSSS!!!”. I love the use of mascarpone for additional creaminess and the marsala just elevates the flavor so much. Plus, those almonds! *Insert heart eyed emoji here*. This looks so delicious! I just love the addition of the mascarpone and that crunchy almond topping is to die for! 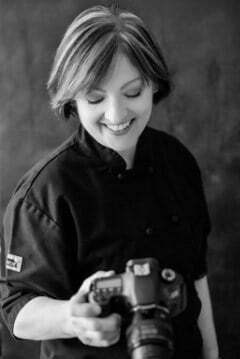 Thanks, Kathryn! 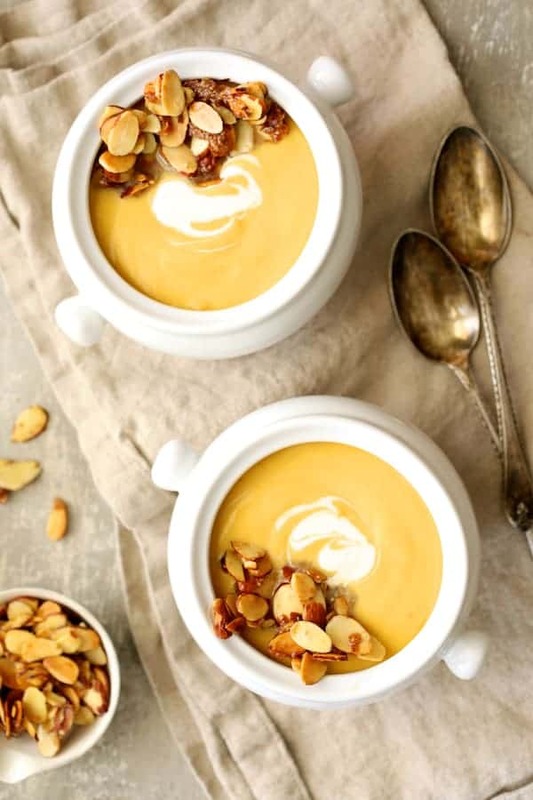 It’s a really lovely soup that’s perfect for this time of year and I can eat the almonds by the handful!